Read the Following: 1. G.O.Ms.No.4, Education (PE-Ser.II)Department, dt. 09.01.2012. 2. G.O.Ms.No12, Education (PE-Ser.II) Department, dt. 30.01.2012. 3. G.O. No.19, School Education (General) Department, dt. 18.05.2016. 4. From the Commissioner and Director of School Education, Telangana, Hyderabad, Lr.Rc.No. 639/A/TSCERT/2016, dt 19.05.2017. The following notification will be published in the Telangana State Gazette. In exercise of the powers conferred by article 309 of the Constitution of India read with sub sections (3) and (4) of section 169, sub-sections (3) and (4) of section 195 and section 243 of the Telangana Panchayat Raj Act, 1994 (Act No.13 of 1994) and section 78 and section 99 of the Telangana Education Act, 1982 (Act No. 1 of 1982), read with sub-section (1) of section 23 of the Right of Children to Free and Compulsory Education Act, 2009 (Central Act No.35 of 2009) and the National CouncilforTeacherEducation(DeterminationofMinimumQualificationsfor Persons to be Recruited as Education Teachers and Physical Education Teachers in Pre-Primary, Primary, Upper Primary, Secondary, Senior Secondary or Intermediate Schools or Colleges) Regulations, 2014 dt.12.11.2014, and in supersession of the Rules issued in G.Os 1 & 2 read above, the Governor of Telangana hereby makes thefollowingRulesfordirectrecruitmenttothepostsofTeachersinthe Government and Local Body Schools of Telangana. (1) These rules may be called the Telangana State Direct Recruitment for the posts of Teachers Rules, 2017. Schools, Zilla Praja Parishad Schools and Mandal Praja Parishad Schools. (1) "AppointingAuthority"means,theDistrictEducationalOfficerofthe districtconcerned in respect of theposts of teachers in Government Schools, Mandal Praja Parishad Schools and Zilla Praja Parishad Schools. (2) “Chief Executive Officer” means the Chief Executive Officer of Zilla Praja Parishad appointed under section 186 of the Telangana Panchayat Raj Act, 1994. (16) “Zilla Praja Parishad” means a Zilla Praja Parishad constituted under the provisions of the Telangana Panchayat Raj Act, 1994. The Recruitment shall be through a selection process as decided by the Telangana State Public Service Commission (TSPSC). Out of the Total Marks of Teacher Recruitment Test, 20% weightage shall be for Teacher Eligibility Test (TET) score for all the posts, except for School Assistant (Physical Education) and Physical Education Teacher. Note: The APTET scores obtained before the appointed day of 02.06.2014 shall only be considered. i. Must possess a Graduate / Post Graduate Degree in Mathematics (or its allied subjects as given in the Annexure to this G.O.) from a University recognised by UGC with 50% marks in either Graduation or Post Graduation (In case of SC / ST / BC / Differently abled candidates, the minimum marks shall be 45%) and Pass in Bachelor of Education (B.Ed.) course with Mathematics as a Methodology subject from any institution recognised by NCTE. ii. Must possess a 4-year B.A.B.Ed. / B.Sc.B.Ed. Integrated degree, with at least 50% marks (In case of SC / ST / BC / Differently abled candidates, the minimum marks shall be 45%) with the Mathematics as a Methodology from any institution recognised by NCTE. Pass in Paper II of Telangana State Eligibility Test (TSTET) / Andhra Pradesh Teacher Eligibility Test (APTET) / Central Teacher Eligibility Test (CTET) with Mathematics and Science as Optional. minimum marks shall be 45%) with the Physical Science / Physics / Chemistry / Science as a Methodology from any institution recognised by NCTE. minimum marks shall be 45%) with the Social Studies / Social Sciences / Geography / History / Politics / Political Science / Economics as a Methodology from any institution recognised by NCTE. Pass in Paper II of Telangana State Eligibility Test (TSTET) / Andhra Pradesh Teacher Eligibility Test (APTET) / Central Teacher Eligibility Test (CTET) with Social Studies as Optional. i. Must possess Graduation with English as one of the Optional / Graduation inLiteratureinEnglish/PostGraduationDegreeinEnglishfroma UniversityrecognisedbyUGCwith50%(IncaseofSC/ST/BC/ Differently abled candidates, the minimum marks shall be 45%) and Pass in Bachelor of Education (B.Ed.) course with English as a Methodology subject from any institution recognised by NCTE. minimum marks shall be 45%) with English as a Methodology from any institution recognised by NCTE. Pass in Paper II of Telangana State Eligibility Test (TSTET) / Andhra Pradesh Teacher Eligibility Test (APTET) / Central Teacher Eligibility Test (CTET) with i. Mathematics and Science or ii. Social Studies as Optional. minimum marks shall be 45%) and Pass in Bachelor of Education (B.Ed.) course with Telugu as a Methodology subject or Language Pandit Training in Telugu from any institution recognised by NCTE. 50% marks (In case of SC / ST / BC / Differently abled candidates, the minimum marks shall be 45%) with Telugu as a Methodology from any institution recognised by NCTE. 50% (In case of SC / ST / BC / Differently abled candidates, the minimum marks shall be 45%) and Pass in Bachelor of Education (B.Ed.) course with Hindi as a Methodology subject or Language Pandit Training in Hindi or Hindi Shikshan Parangat from any institution recognised by NCTE. 50% marks (In case of SC / ST / BC / Differently abled candidates, the minimum marks shall be 45%) with Hindi as a Methodology from any institution recognised by NCTE. 50% (In case of SC / ST / BC / Differently abled candidates, the minimum marks shall be 45%) and Pass in Bachelor of Education (B.Ed.) course with Urdu as a Methodology subject or Language Pandit Training in Urdu from any institution recognised by NCTE. 50% marks (In case of SC / ST / BC / Differently abled candidates, the minimum marks shall be 45%) with Urdu as a Methodology from any institution recognised by NCTE. i. Must possess Graduation with Kannada as one of the Optional / Graduation in Literature in Kannada / Bachelor’s Degree in Oriental Language (BOL) in Kannada / Post Graduation Degree in Kannada from a University recognised by UGC with 50% (In case of SC / ST / BC / Differently abled candidates, the minimum marks shall be 45%) and Pass in Bachelor of Education (B.Ed.) course with Kannada as a Methodology subject or Language Pandit Training in Kannada from any institution recognised by NCTE. 50% marks (In case of SC / ST / BC / Differently abled candidates, the minimum marks shall be 45%) with Kannada as a Methodology from any institution recognised by NCTE. marks shall be 45%) and Pass in Bachelor of Education (B.Ed.) course with Tamil as a Methodology subject or Language Pandit Training in Tamil from any institution recognised by NCTE. 50% marks (In case of SC / ST / BC / Differently abled candidates, the minimum marks shall be 45%) with Tamil as a Methodology from any institution recognised by NCTE. i. Must possess Graduation with Marathi as one of the Optional / Graduation in Literature in Marathi / Bachelor’s Degree in Oriental Language (BOL) in Marathi / Post Graduation Degree in Marathi from a University recognised by UGC with 50% (In case of SC / ST / BC / Differently abled candidates, the minimum marks shall be 45%) and Pass in Bachelor of Education (B.Ed.) course with Marathi as a Methodology subject or Language Pandit Training in Marathi from any institution recognised by NCTE. minimum marks shall be 45%) with Marathi as a Methodology from any institution recognised by NCTE. i. Must possess Graduation with Sanskrit as one of the Optional / Graduation in Literature in Sanskrit / Bachelor’s Degree in Oriental Language (BOL) in Sanskrit / Post Graduation Degreein Sanskrit from a University recognised by UGC with 50% (In case of SC / ST / BC / Differently abled candidates, the minimum marks shall be 45%) and Pass in Bachelor of Education (B.Ed.) course with Sanskrit as a Methodology subject or Language Pandit Training in Sanskrit from any institution recognised by NCTE. 50% marks (In case of SC / ST / BC / Differently abled candidates, the minimum marks shall be 45%) with Sanskrit as a Methodology from any institution recognised by NCTE. ii. Must possess Graduation in Physical Education with 40% marks (In case of SC / ST / BC, the minimum marks shall be 35%) or Graduation in Physical Education i.e.. B.P.Ed. course of three years duration. iii.Must possess a Bachelor’s Degree with minimum 50% marks. i. MustPossessIntermediate/SeniorSecondary(oritsequivalent)as recognised by the Board of Intermediate, Telangana with at least 50% Marks (In case of SC / ST / BC / Differently abled candidates, the minimum marks shall be 45%) and Pass in 2-year Diploma in Elementary Education / 4-year Bachelor in Elementary Education. ii. MustPossessIntermediate/SeniorSecondary(oritsequivalent)as recognised by the Board of Intermediate, Telangana with at least 45% Marks (In case of SC / ST / BC / Differently abled candidates, the minimum marks shall be 40%) in accordance with the NCTE (Recognition Norms and Procedure) Regulations, 2002 (i.e those who are admitted into D.El.Ed. up to the year 2007)and Pass in 2-year Diploma in Elementary Education / 4-year Bachelor in Elementary Education. i. Must possess Graduation with Telugu as one of the Optional / Graduation in LiteratureinTelugu/ Bachelor’sDegreeinOrientalLanguage(BOL)in Telugu / Post Graduation Degree in Telugu from a University recognised by UGC with 50% (In case of SC / ST / BC / Differently abled candidates, the minimum marks shall be 45%) and Pass in Bachelor of Education (B.Ed.) course with Telugu as a Methodology subject or Language Pandit Training in Telugu from any institution recognised by NCTE. marks shall be 45%) and Pass in Bachelor of Education (B.Ed.) course with Hindi as a Methodology subject or Language Pandit Training in Hindi or Hindi Shikshan Parangat from any institution recognised by NCTE. minimummarksshallbe45%)withUrduasaMethodologyfromany institution recognised by NCTE. i. Must possess Graduation with Kannada as one of the Optional / Graduation in Literature in Kannada / Bachelor’s Degree in Oriental Language (BOL) in Kannada / Post Graduation Degree in Kannada from a University recognised by UGC with 50% (In case of SC / ST / BC / Differently abled candidates, the minimum marks shall be 45%) and Pass in Bachelor of Education (B.Ed.) course with Kannada as a Methodology subject or Language Pandit Training in Urdu from any institution recognised by NCTE. course with Marathi as a Methodology subject or Language Pandit Training in Marathi from any institution recognised by NCTE. i. Must possess Graduation with Tamil as one of the Optional / Graduation in Literature in Tamil / Bachelor’s Degree in Oriental Language (BOL) in Tamil / Post Graduation Degree in Tamil from a University recognised by UGC with 50% (In case of SC / ST / BC / Differently abled candidates, the minimum marks shall be 45%) and Pass in Bachelor of Education (B.Ed.) course with Tamil as a Methodology subject or Language Pandit Training in Tamil from any institution recognised by NCTE. i. Must possess Graduation with Sanskrit as one of the Optional / Graduation in Literature in Sanskrit / Bachelor’s Degree in Oriental Language (BOL) in Sanskrit / Post Graduation Degree in Sanskrit from a University recognised by UGC with 50% (In case of SC / ST / BC / Differently abled candidates, the minimum marks shall be 45%) and Pass in Bachelor of Education (B.Ed.) course with Sanskrit as a Methodology subject or Language Pandit Training in Sanskrit from any institution recognised by NCTE. Intermediate Education, Telangana with minimum 50% marks. Physical Education from an institution recognised by the NCTE. 2.Must possess a Bachelor’s Degree. V. Language / Medium of Study Qualifications for Non-language subjects: The candidateswhohave (i) passed either SSC (or its equivalent) Examinationor Intermediate(oritsequivalent)orDegreeExaminationinthemediumof instructionconcernedor(ii)havestudiedtheLanguageconcernedasFirst Language in SSC (or its equivalent) oras Part I in Intermediate (or its equivalent) or as Second Language in Intermediate (or its equivalent) or as a Subject in Degree, are eligible for the posts of SA (Mathematics, Biological Sciences, Physical Sciences, Social Studies & Physical Education), SGT and PET in the concerned medium school. The Medium of the TRT Question Paper shall be the same as the Medium of the Post opted for. The Teacher Recruitment Test (TRT) shall be conducted by the Telangana State Public Service Commission (TSPSC) as per the Orders issued by the State Government in G.O. No.19, School Education (General) Department, dt. 18.05.2016 and other orders issued from time to time. The TSPSC shall issue Notification for direct recruitment for the posts of Teachers inaccordancewiththeordersissuedbytheGovernmentdulynotifyingthe vacanciesas per the requisition furnished bytheCommissioner & Director of School Education for the 31 Revenue districts as formed/reorganised by the State of Telangana w.e.f.11.10.2016, taking each such district as the unit of appointment as per the relevant Rules. Local Scheduled Tribe candidates shall only be considered for selection and appointment against the vacancies in Scheduled Areas as per G.O.Ms.No.3, Social Welfare (TW.Edn.II) Department, dt.10.01.2000. They shall also be considered for selection to the posts notified in Plain area if they come up for selection. As per Telangana State and Subordinate Service Rules, 1996 as amended from time to time. 1.The rule of reservation to local candidates is applicable and the provisions of Telangana Public Employment (Organisation of Local Cadres and Regulation of Direct Recruitment) Order (Presidential Order) 1975 and amendments there to shall be followed strictly. 2.The rule of special representation in the matter of appointment of candidates belonging to Scheduled Castes, Scheduled Tribes, Backward Classes, Physically Challenged, Ex-service Men and Women is applicable as per the Telangana State and Subordinate Service Rules, 1996 as amended from time to time. 3.No Physically Challenged quota should be extended for the School Assistant (Physical Education) and Physical Education Teacher Posts as the said quota is not considered for admission into the Physical Education Training courses. The posts earmarkedforSchoolAssistant(PhysicalEducation)andPhysicalEducation Teacher should be filled with eligible meritorious candidates as per the Government Memo.No.1351/Ser.VI/2008-2, dated. 01.04.2008. 4.The number of candidates selected shall be equivalent to the number of vacancies notified. There shall be no waiting list and posts if any unfilled for any reason whatsoever shall be carried forward for future recruitment. AppointmentOrdersaspertherelevantRulesandPostingOrderstothe selected candidates as per the choice exercised by the selected candidates in the counselling for the schools under the control of the Appointing Authority. Detailed guidelines regarding the counselling procedures etc., will be issued separately. 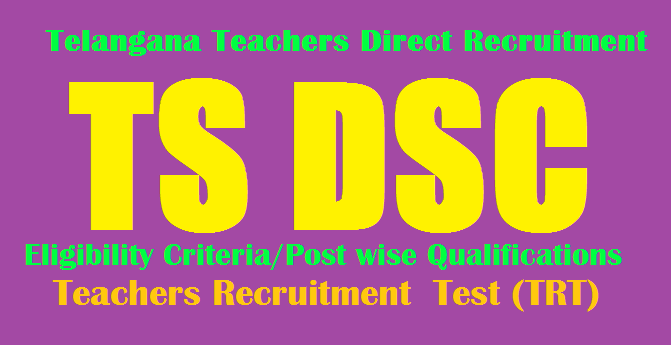 (10) The qualifications prescribed for Direct Recruitment of the Teachers vide G.O.Ms.No.11, School Education(Ser.II)Department, dated 23.1.2009 and G.O.Ms.No.12, School Education(Ser.II) Department, dated 23.1.2009 shall stand amended by the qualifications prescribed for the Direct Recruitment of the Teachers in these Rules(Rule-4). (11) Notwithstanding any provisions to the contrary contained in any other rules relating to the recruitment of Teachers, the provisions of these rules shall prevail and be applicable for the purpose of recruitment of Teachers, 2017. 4 Botany Biochemistry, Biotechnology, Environmental Science, Forensic Science, Genetics, Microbiology, Nutrition & Dietetics, Industrial Microbiology, Agriculture, Dry Land Agriculture, Food Technology, Biological Science, Geology, Forestry, Life Sciences, Sericulture, Horticulture. 5 Zoology Biochemistry, Biotechnology, Environmental Science, Forensic Science, Genetics, Microbiology, Nutrition & Dietetics, Industrial Microbiology, Public Health, Human Genetics, Biological Science, Fisheries, Sericulture, Aquaculture, Marine Science, Poultry Sciences, Food and Nutrition, Wildlife, Dairy Science. 14 Commerce Economics/Business Economics, Business Organisation and Management, Statistics/ Business Statistics, Quantitative Techniques, Financial Services, Banking and Insurance, Accountancy / Financial Accounting, Fundamental of Information Technology.